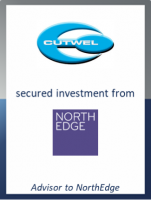 GCA Altium acted as exclusive financial advisor to private equity firm NorthEdge Capital on its investment in Cutwel Limited, a distributor of precision engineering tools. Headquartered in Cleckheaton, West Yorkshire, Cutwel Limited is a leading engineering tooling supplier, providing a range of tools and accessories, comprising cutting tools, workholding, toolholding, measuring tools, lubrication, storage cabinets and 3D printers. The company has an active customer base of c. 4,500 SME accounts, employs over 50 people and operates from a purpose-made 24,000 sq. ft. distribution facility. NorthEdge is backing the existing management team led by Adam Gillard, Graham Short and Shaunie Mangham as the company continues to scale its sales team with investment in recruitment and training. Cutwel aims to double its headcount over the next four years and further drive sales across the SME market. This represents the seventh transaction GCA Altium have advised on in 2018 involving Yorkshire based corporates.